I’ve been a bit quiet in this space lately. We’ve been adjusting to a new school year and working through some projects. 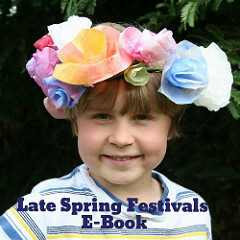 I am delighted to announce that my dear friend Eileen Straiton (of Little Acorn Learning) and I have finished another big e-book. 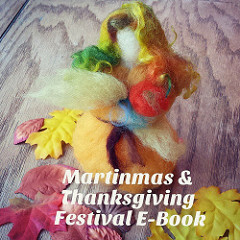 This one is our Autumn Equinox & Michaelmas Festival E-Book and I’d be honored if you’d check it out and spread the word a little. It was a pleasure to work with Eileen on this and I’m really proud of it. We have such a great rapport and similar values, and I think this comfort and compatibility reflects in our e-book. So here’s to healthy, joyful, creative collaboration! Here is a little teaser: a mosaic of just some of the images from the projects and activities we offer in our e-book. in your home or school! 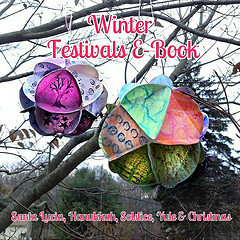 So, if you’re wondering how to make this time of year feel magical, this e-book may be just what you need. Thanks for peeking! 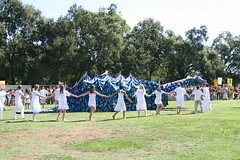 We had a marvelous Michaelmas—almost two weeks ago now—celebrating with our school community with pageantry and gusto. Grades 2 through 12 participated and it was as inspirational as ever. 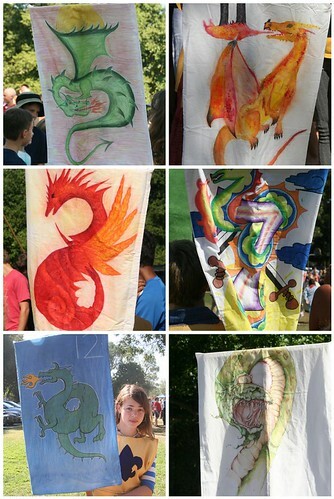 This year I was particularly impressed by the dragon banners for each grade. Aren’t they wonderful? 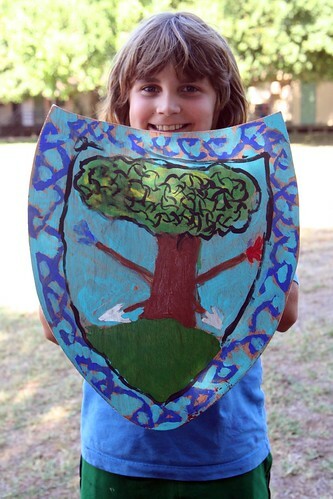 This year, Lucas is in the fourth grade, and traditionally that class builds and decorates their own shields. In the Michaelmas festival, they are brave warriors who protect the innocent villagers from the dragon when it arrives on the scene. The shields they made were breathtaking, especially when seen all together. They were decorated with swords, arrows, snakes, dragons, wolves, and even sea turtles. Each child designed his or her own crest for the shield. 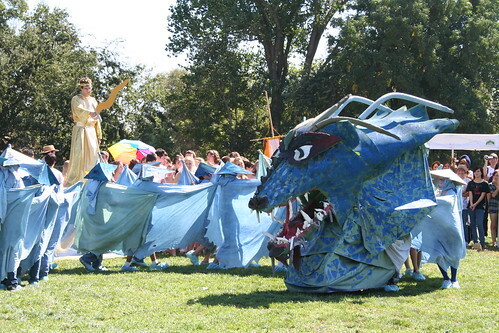 The mighty celestial dragon, built and manned by the sixth grade class, was impressive and graceful. George faced it down and tamed it with his wit and goodness, with plenty of help from Michael. 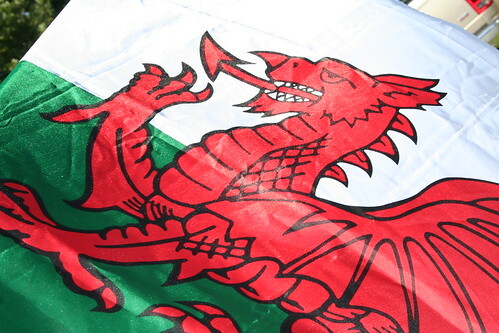 When I conquer fear, the dragon’s chains I tightly bind! Michael is at my side! We also celebrated Michaelmas at home. 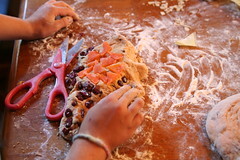 We made dragon bread, adding an exciting, wicked twist with brown sugar, butter, and dried fruits (cherries, blueberries, and cranberries) rolled up inside. 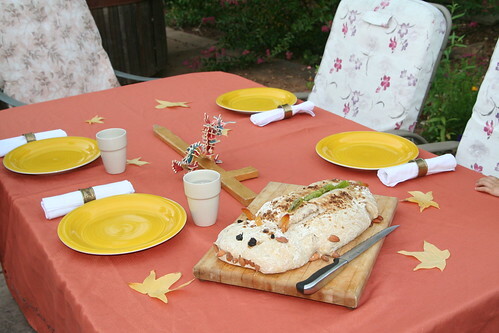 We gave our dragon bread dried, candied cantaloupe horns and dried, candied kiwi plates down his spine. Almonds served nicely as teeth and claws. And for the second year in a row, we barbecued chicken and created a kind of dragon beast main dish. 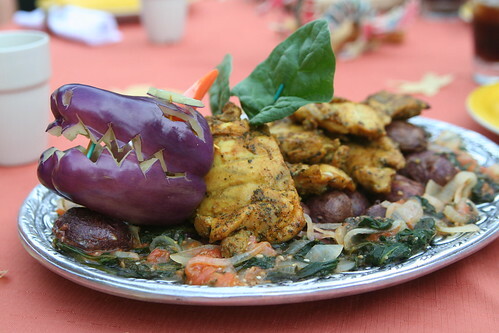 The “dragon” (colored yellow with turmeric) is resting on purple potato “rocks” in a field of greens and tomatoes and onions (a field of vanquished knights?). I carved a dragon head from a purple pepper and give the beast spinach wings. The boys thought this was pretty awesome, and it was tasty! We also did a dragon craft over a couple of days. 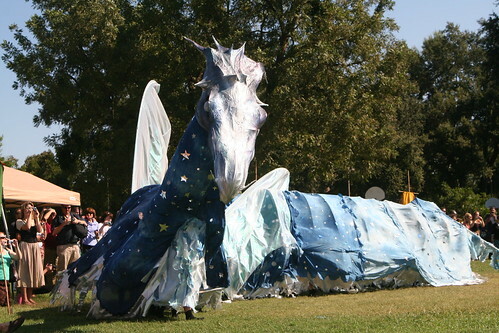 I might write more about this later, but here’s the finished dragon we made. About a week later, Asher’s Kindergarten class held their own Michaelmas celebration. The children all dyed silk capes of golden light using marigold petals in school. The older children in the Kindergarten (second-year kids or children who will be there only one year) sanded and built golden wooden swords. All the children were given golden crowns to wear. Oh Michael, for you we wait! We follow you; show us the way! With joy we greet the autumn day! We parents were invited to join the class in the school farm amid the fruit trees to witness their Michaelmas circle time verses and songs. It was supremely sweet. I don’t know the parents of this class very well yet, so I don’t have their permission to post photos. Suffice it to say, it was this cute, times 24. 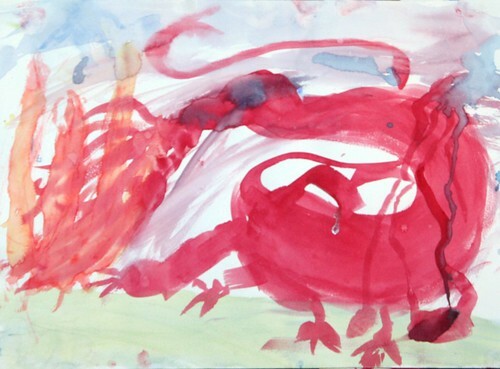 Lucas’s watercolor dragon painting, which is on display in our home. Today is the official Feast of Saint Michael. Michael was the archangel who threw Lucifer out of heaven. It is Michael who sends us courage to fight the good fight, to face up to dragons and monsters in ourselves and our society, which seems so very necessary in these difficult times. 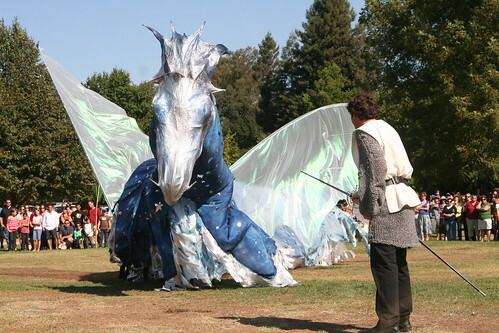 How do you meet on the battlefield the dragons of fear, hate, greed, and bigotry? What will you do to celebrate and conjure courage and goodness? Mix together the yeast and warm water. Let it rest. In another bowl, mix eggs, oil, salt, and sugar. Add flour. Add yeast and water mixture and mix until blended. Knead the dough on a floured surface until it’s firm and smooth, then round it into a bowl coated in a little oil. Turn the ball over once to coat both sides of dough with oil. Let the dough rise in a warm place until it has doubled in size. 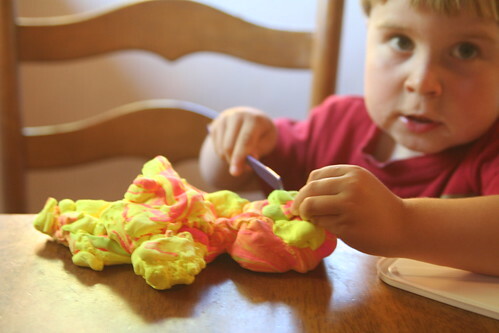 Now place your dough on a greased cookie sheet and shape it into a dragon. You can use scissors to cut legs, a mouth, scales, etc. Poke in almonds for teeth, or dried fruits for spikes, if you wish. Cover and let your dragon bread rise again for about 30 minutes. Bake at 350 degrees until done. Devour with righteousness! Of course, any bread recipe you like will work just as nicely. Yum! It’s Michaelmas time again, one of my favorite times of year. 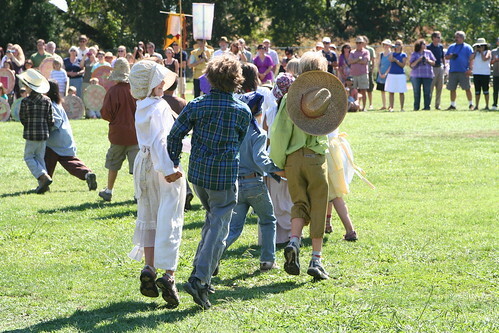 Over the years, as I’ve engaged in our Waldorf school’s Michaelmas Festival, I’ve come to see Michaelmas as a truly enlivening and uplifting event that reaffirms my faith in humanity’s goodness. Michaelmas happens each year at a time when I find myself noticing nature turning toward dryness and decay. I notice all the upheaval in the world, both personal and global. It’s not that such things don’t happen at other times of the year, but something about this season makes them more poignant for me. As the nights grow longer and the year begins to die, my own dragons surface and start making noise that cannot be ignored. And so, I pay them some attention. For me, the Michaelmas festival reminds us that we all have a part of us that lurks in the murk, with our dragons—fears, angers, resentments, jealousies, laziness, etc.—as bitter (and sometimes comfortable) companions. Our societal dragons are fear, hate, bigotry, greed, and isolationism. And yet despite our foibles and in the middle of our challenges, we keep striving, working for the good. We shine our lights into our days and nights and work to make the world brighter in small ways and in big. With Michaelmas, we have our metaphor of plucking up our courage and going out on the field to meet our dragons head-on. Though we are frightened, we call them by name and take a good hard look at them in the sunlight. And in doing so, we shrink them and corral them, tame them or banish them, or simply bring them under our better control. When we face reality with honesty and bravery, we are imbued with light and can use this strength daily in our interactions will all people. But let me be clear, dragons are mighty teachers, too. Our dark sides can be a source of inspiration, power, and mystery. The fertile soil of our inner darkness must be balanced and harnessed by the light in us, that we may live healthy, happy lives and do soulful work. Asher is experiencing in Kindergarten the story of a simple boy, George, who acts out of bravery and righteousness to help others and in doing so overcomes fear and darkness. He retold the story to me yesterday with great gusto. The older Kindergarten children are making their wooden swords of righteousness. They are dyeing silken capes with golden light. They are preparing themselves to be bold and good in the world. Lucas’s class, the fourth grade, are making shields. 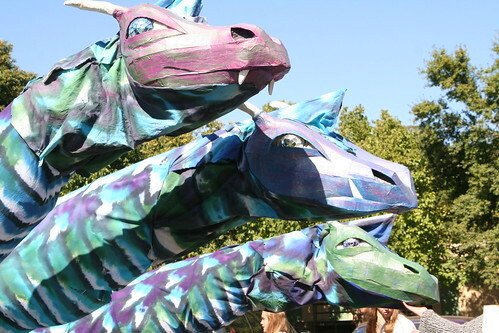 In the Michaelmas festival this Friday, they will protect the villagers when the dragon arrives. Their great courage will shield the innocent from harm. 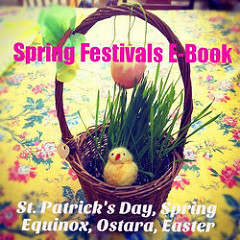 So, if you’re curious about this festival, here are some other places you can look. I hope that it might inspire you as it has inspired me. My post about Honoring Our Dragons. 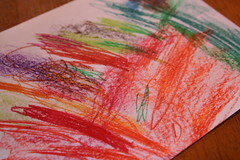 A Michaelmas craft the boys and I enjoyed last year. 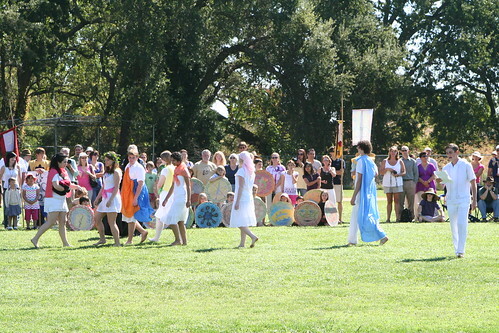 Last year’s 2010 School Michaelmas Festival. And here’s 2009’s festival post. Last year’s family Michaelmas celebration at home. How might you make a dragon dinner? Lots of info about Saint Michael and Michaelmas here. Carrie’s 2009 post about Michaelmas on the Parenting Passageway is here. 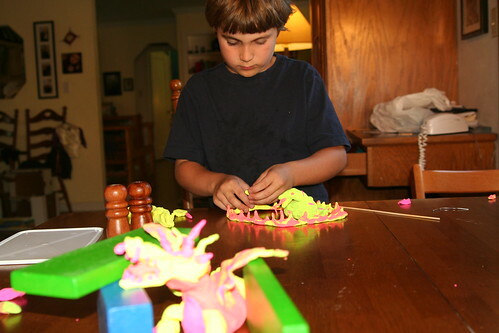 A great post about building a dragon with a sixth grade Waldorf class is found on The Waldorf Way blog. A new article about Michaelmas “The Festival of Human Becoming” by Danielle Epifani on The Wonder of Childhood online magazine. The meaning of the Michaelmas festival by Rudolf Steiner is here. Rocking Granola has a great list of more resources here. I promise this is my last post about Michaelmas. Maybe I got carried away a bit, but I already mentioned that this festival kind of spoke to me a lot this year. 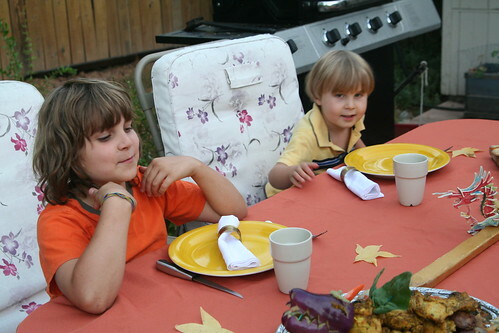 We had a special dinner on Friday night after the school’s Michaelmas festival. (We have lots of special dinners, but usually Ian cooks them. This one was a joint effort.) As far as I’m concerned, any dinner featuring homemade bread and a first course is special. Anyway, my parents joined us and it was kind of both Michaelmas and a celebration of Ian’s birthday. 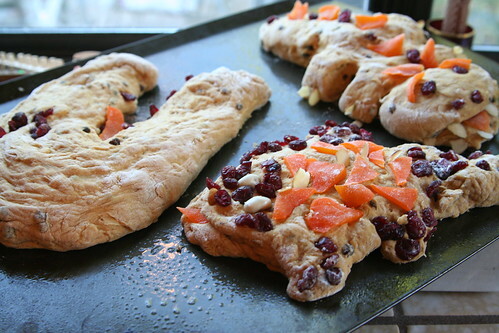 I couldn’t get Asher to join in this activity, but Lucas, Daddy and I all enjoyed shaping dragon breads. The bread recipe I used ended up being so wet and sticky I had to keep adding more and more cups of flour. It turned out yummy, but we ended up with far more bread dough than we needed! We shaped three handsome dragon loaves and were able to send an unbaked loaf home with Grandma and Papa. 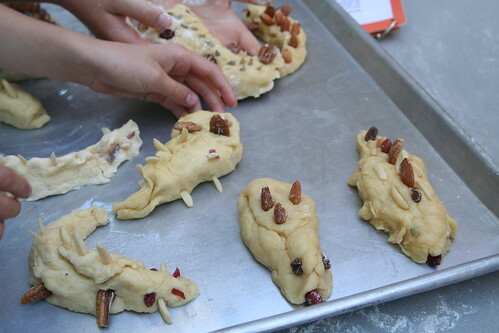 Here are our dragons before they were baked. They are embellished with almond slices, dried cranberries, and dried mango, which we snipped into pointy plates and scales. 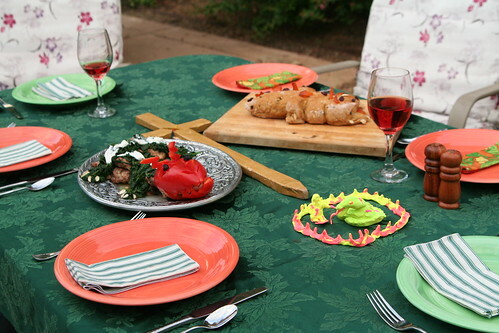 Our Michaelmas table set for dinner outside in the warm autumn evening. That’s Lucas’s sword he made for Michaelmas last year in second grade. 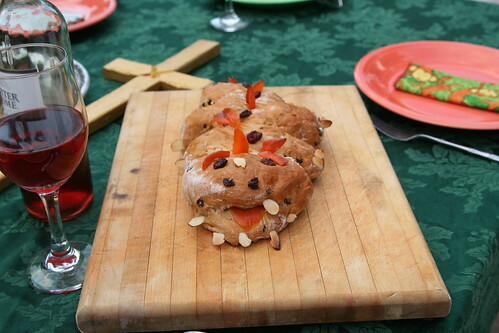 Lucas picked my dragon bread to eat first. He was dumbstruck when I handed him the good bread knife and asked if he would do us the honor of slaying the dragon for us. He did a great job slicing the bread for everyone. 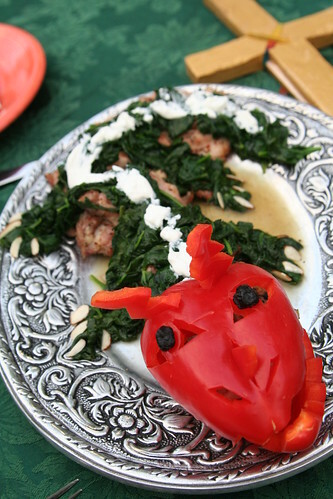 I didn’t take a picture of my red lentil soup, but here’s the main course: dragon (grilled chicken thighs, sauteed spinach scales, sour cream, almond slices for toes, and a carved red bell pepper head.) I have to admit, carving and arranging this was super fun. Seeing the kids’ faces when I brought this out was the best! Thanks for grilling the chicken, Ian! Okay. That’s it. Now I can start thinking about Halloween. 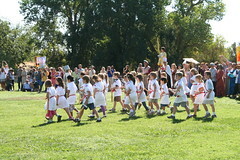 Once again, our beautiful school celebrated Michaelmas with a beautiful festival on Friday. Ian and I both got to attend, as did many from our school community. It was inspiring and awesome. The twelfth grade put on a play about doing the right thing and facing down evil. Here are our vibrant third graders, who played joyful villagers and performed a country dance. There’s my darling son in blue, dancing with a lovely classmate! All is well, until a terrible sound shakes the whole village. What evil thing could it be? A dragon! 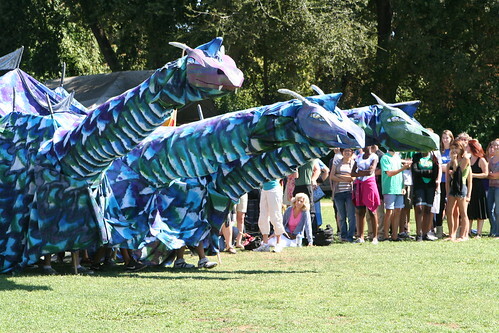 This fearsome, three-headed beast was created by the sixth grade and their talented teacher and parents. The entire sixth grade class is manning this huge puppet. Here comes the dragon! Heroic St. George meets it on the field. The second graders, wearing their tunics with the cross of St. George and carrying their golden swords of righteousness, subdued the great creature with some help from the brave seniors. The people and the village are saved! 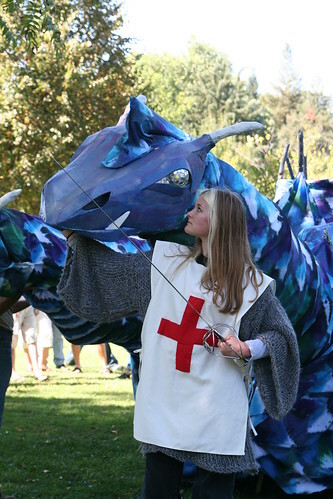 Here is St. George with the tamed dragon. The people have transmuted the forces of darkness with their courage, their champion, and the inspiration of Michael. It’s Friday and our son’s school is celebrating Michaelmas today with a festival and dragon play. Lucas’s third-grade class will be the village children and will do a country dance. 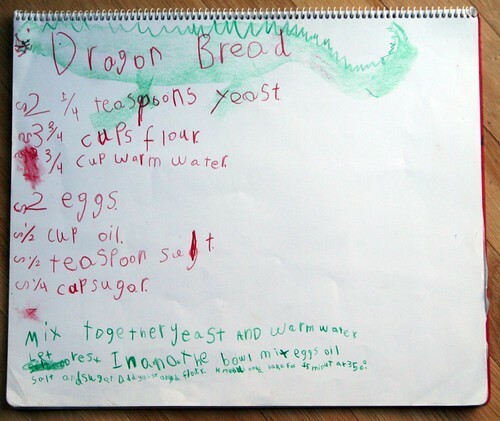 Tonight our family will have a modest celebratory meal with dragon bread. This festival is speaking to me more each year. We all face our own demons every day. We strive to subdue or conquer them so we may shine our inner light into our own lives and the lives of those we love. And the world is a brighter place for it. He’s on the path to battle ‘gainst darkness and strife. He is the heavenly warrior, protector of life. The light he sheddeth fails not, nor does it fade. We’ll don Saint Michael’s armor and onward will fare. We forge our way through darkness Saint Michael to find. Lead us into battle and show us thy way. 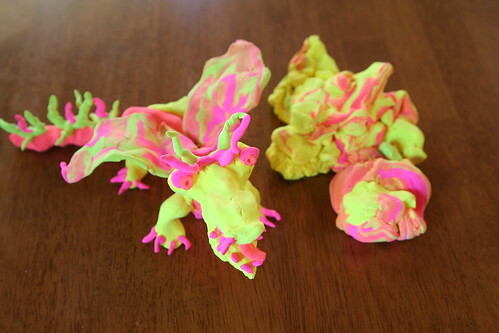 Yesterday afternoon, after school, the boys and I pulled down some Crayola modeling “clay” (in exciting day-glo colors) that we had on hand and sculpted dragons in honor of Michaelmas. 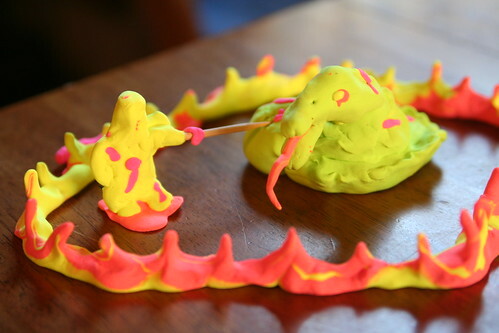 We spent a happy 30 to 40 minutes sculpting, with each of us working on our own dragon. Lucas’s sculpture was ambitious! He sculpted the Archangel Michael battling the dragon within a ring of fire! He is justifiably pleased with the result. He certainly remembered the story well. Asher got to use a plastic knife! Big fun. Here is my dragon posing next to Asher’s dragon, which morphed a lot during our crafting, just as you would expect for a 3-year-old. His dragon also got lots of lovely dragon play. 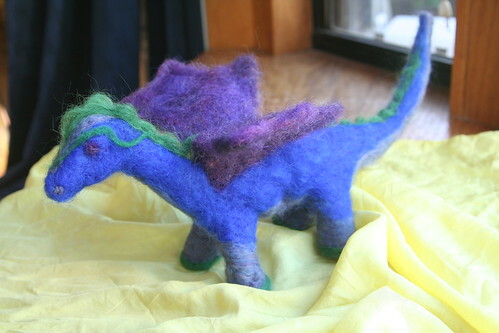 Here is a needle-felted dragon I made last Sunday. I had some time in the company of some of my favorite people in the world and my hands happily worked on this while we were visiting. I think he needs some fiery breath! Some of my research into Michaelmas has brought me to these lovely resources, which I gladly share. I am actually still debating about whether to cook a Michaelmas meal today or save it for Friday, when our school will celebrate this festival. Over the last two weeks, the children in Lucas’s school have been preparing for and celebrating Michaelmas. They’ve heard, watched, and acted out the story of George the farm boy and the dragon. The archangel Michael helps George to overcome the beast who has been ruining the crops. Lucas has jealously watched while the older children sand, stain, and assemble their own wooden swords. (He will get to make his own next year in Kindergarten.) 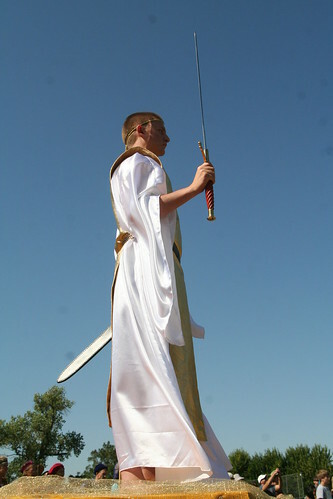 Mrs. Klocek says he has worked diligently on the classroom swords (3 will stay in the classroom for everyone to play with); he has been fascinated with the project, the object itself, and the work. I’ve also observed that the story of George, Michael, and the dragon is living in him. He’s been chosen to manipulate the dragon during puppet shows. 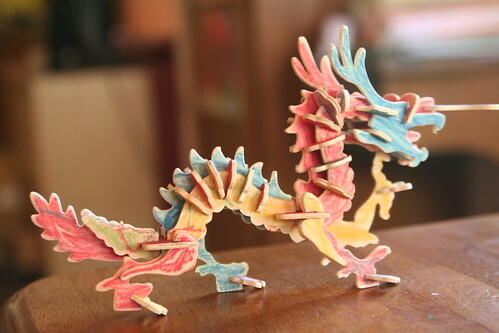 When I asked what the dragon puppet looked like, he explained that it was a red silk and a green silk knotted together. He has played a cat during their play of the story. His teacher says he’s really into it, attentive, and plays Michael at dress-up time. Last Friday his class celebrated Michaelmas. He brought home a silk cape that they died yellow with marigold petals and a golden crown (like Michael wears). The older children took home their swords. Lucas doesn’t seem too disappointed about not having a sword of his own, which is good because I was a little worried about it (worried both about him having one and not having one). 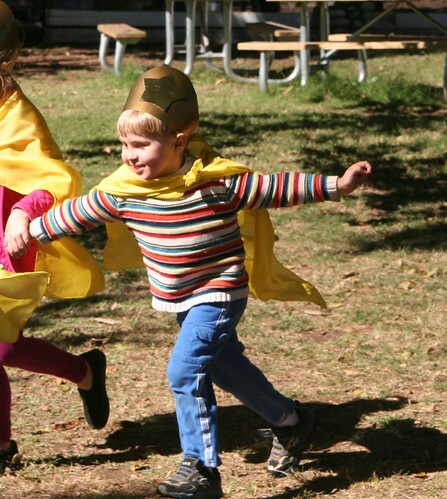 The significance of this holiday in the Waldorf schools, from what I gather, is that the story of a simple boy who acts out of bravery and righteousness on behalf of others can overcome fear and darkness. That light must be honored and respected, and can be the greatest weapon we possess in the face of frightening challenges. 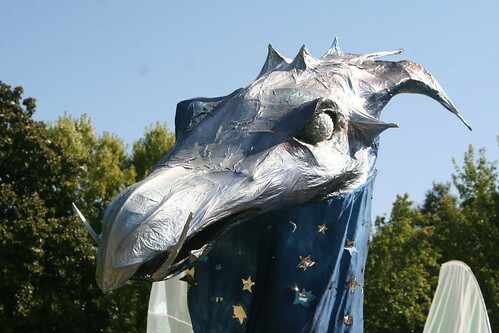 The emphasis in the schools is not placed on killing the dragon (which some fundie Christians take to be a metaphor for pagan/Goddess religion rather than how I see it: a metaphor for fear, hate, bigotry, and isolationism). Rather, in the schools, the children (especially the older children) are taught that we all have within us a dark side, and that we must acknowledge it, learn to control it, and not act out of our destructive emotions. Our dark sides can be a source of strength, inspiration, power, and mystery, but they must be balanced and harnessed by the light for us to live healthy, happy lives and do good in the world. The youngest children don’t get all that analysis; they just get the story, which lives in them and informs their hearts. It gives them hope as the seasons change and darkness becomes more pervasive and present in their worlds. “The end of September not only brings glorious autumn weather, it is also a time in the year when day and night stand in balance before we rapidly slide into the long nights of winter. In Waldorf schools throughout the world, at this time of year, communities gather to celebrate the festival of Michaelmas. So it was that we came together last Friday (on the precise day of Michaelmas, September 29th) to face and vanquish a magnificent dragon. Why is this little-known festival celebrated with such enthusiasm and care? Michaelmas offers us many gifts. 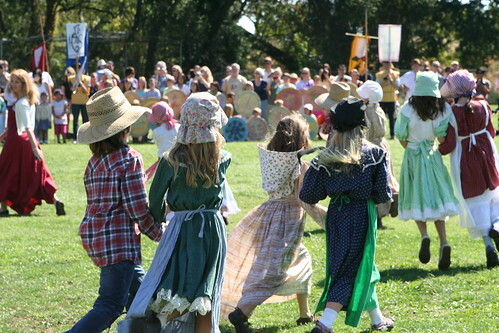 It is a celebration of harvest, a focus of agricultural communities at this time of the year. The bounty of the earth is all around us; plants tell us that the expansive days of summer have passed and the quiet mood of winter, when preparations of a new season of growth can occur, will soon be upon us. As a festival, Michaelmas celebrates community, offering an opportunity for us to come together and share fellowship. 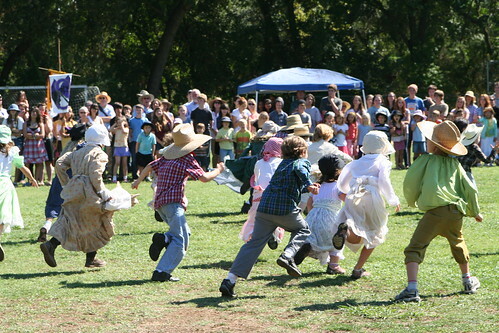 It is a community gathering: Our athletic field becomes the village green of old. In addition to these obvious gifts, Michalemas offers a message that is pertinent and highly relevant to our modern condition. Michaelmas speaks of courage, of facing difficult odds, of the triumph of good over evil. It does this through story and symbol. 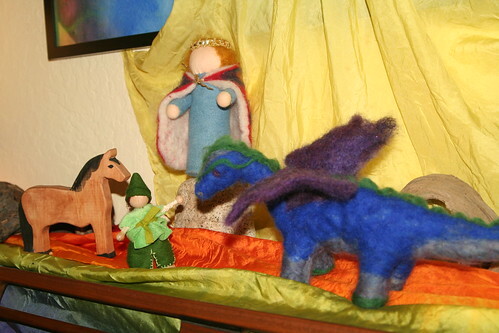 There are two central figures in the story: the dragon and Michael. 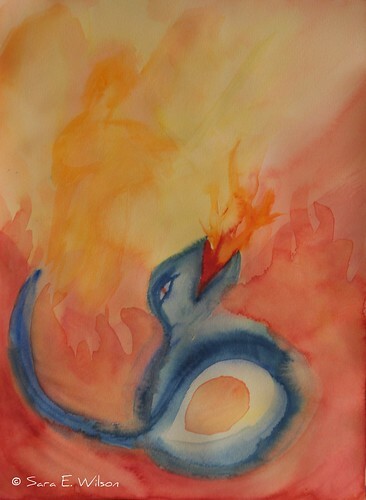 Unlike its elevated role in many Eastern cultures, in the West the dragon symbolizes our lower selves, the darker forces of nature that are part of our humanity, to challenge and test us. The festival of Michaelmas reminds us that, with heavenly help, we can summon great courage and face our fears and threats. 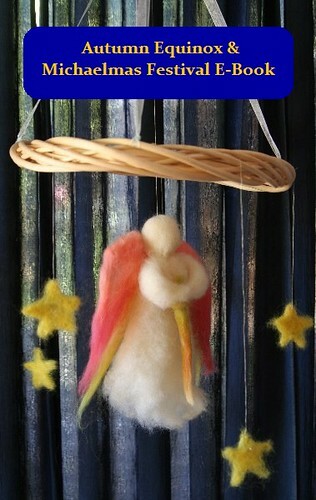 Help is on hand in the form of the Archangel Michael, beloved by children. In this time, maybe more than ever before, we all need reminders of strength, selflessness, courage, hope, and the ultimate triumph of good over evil. Michaelmas, or the Feast of Saints Michael, Gabriel and Raphael is a day in the Christian calendar, taking place on 29 September. Because it falls near the equinox, it is associated with the beginning of Autumn and the shortening of days. St. Michael, one of the principal angelic warriors, was seen as a protector against the dark of night. Michaelmas has also delineated time and seasons for secular purposes as well, particularly in the United Kingdom and Ireland. Michaelmas, September 29: St. Michael is known as the conqueror of the dragon, the heavenly hero with his starry sword (cosmic iron) who gives strength to people. Michaelmas, Christian feast of St. Michael the Archangel, celebrated in the Western churches on September 29 and in the Eastern (Orthodox) Church on November 8. In the Roman Catholic Church, it is the Feast of SS. Michael, Gabriel, and Raphael, archangels; in the Anglican Church, its proper name is the Feast of St. Michael and All Angels. The cult of St. Michael began in the Eastern Church in the 4th century and spread to Western Christianity by the 5th century; the date of May 8 commemorates the dedication of a sanctuary to St. Michael at Monte Gargano in Italy in the 6th century. Because of St. Michael’s traditional position as leader of the heavenly armies, veneration of all angels was eventually incorporated into his cult. During the Middle Ages, Michaelmas was a great religious feast and many popular traditions grew up around the day, which coincided with the harvest in much of western Europe. In England it was the custom to eat a goose on Michaelmas, which was supposed to protect against financial need for the next year. In Ireland, finding a ring hidden in a Michaelmas pie meant that one would soon be married.